Dominic Dromgoole directs a new production for 2013 of A Midsummer Night&apos;s Dream at Shakespeare's Globe on the South Bank starring Michelle Terry in the dual roles of Hippolyta and Titania and John Light as her consort, Theseus and Oberon. The hunting scene which opens the play has John Light wearing a magnificent headdress of antlers and with Michelle Terry in furs. This is a production which evokes the Druid tradition of the English countryside. Jonathan Fensom&apos;s designs have feather and horn headdresses and animal masks, fairy men are bare-chested and Bottom's donkey head is realistic with motile ears. The most joyous aspect of Dromgoole's play is the part of the Mechanicals who arrive with a glorious cloggy dance led by Punchdrunk stalwart Tom Lawrence as Snout, who does his best to keep the rest in time. So often I find the Mechanicals tedious as the Tudor bawdy humour falls flat but here they are the stars. The play within a play, The Tale of Pyramus and Thisbe I have never seen so well done. A miniature Globe stage is erected on the actual stage, so that the amateur actors are terribly overcrowded and there is no room at all for Thisbe&apos;s (Christopher Logan) farthingale hooped petticoat. Wall, who is played by Snout, is encased in a woven willow fencing, impossibly wide, with plaster patches and the chink for Pyramus and Thisbe to talk through is made at crotch height which is hilarious. Pearce Quigley's vainglorious and hugely comic Bottom forgets his lines continuously and asks for a prompt many times. Of the fairies, Matthew Tennyson is original as a splendidly ironic Puck, full of swagger and camp detachment. John Light&apos;s Oberon will hang over Helena (Sarah MacRae) suspended from a rope on one of the Globe's huge pillars, looking to stroke her beautiful long, blonde hair. When we hear the poetic language in the speech about the disruption caused to the seasonal English weather by the argument between Oberon and Titania, we grasp at this explanation for the coldest English Spring in 50 years. As Titania talks about the sensual treats in store for Bottom as her lover, fairies bring out white butterfly nets and catch lanterns floating down from the Upper Gallery. Michelle Terry has a forceful voice as both Titania and Hippolyta and she and John Light have a strong and regal presence. Although the Lovers are perhaps eclipsed in this production, the muddle is expressed as all four are intertwined as if in a physical puzzle or a game of Twister. Demetrius (Joshua Silver) manages a back somersault when he first sees Helena after the administration of the love drug in a witty move. Peter Quince (Fergal McElherron) &apos;s elation on his play being chosen reacts like hysterical talent show winners, hands with fingers splayed, fanning his face to recover from the surprise. These are the director's touches which make the play special. At three hours on the wooden seats which can be backless, but with a hired cushion, this production of A Midsummer Night&apos;s Dream makes the time fly and is truly enjoyable comedy. The crowd have always loved the Globe but it takes more to thrill the critics and Dominic Dromgoole has the magic touch. 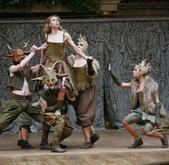 Oh and the English weather has improved amazingly since we saw Oberon and Titania reconciled!